As the year comes to a close, it is time to give out the annual Howitzer Awards instituted by RTDM to recognize excellence in news reporting and honor all those inveterate media outlets who have brought to us news as it should be presented, in its pristine pure form, bereft of all sensationalism and falsehoods, presented with the help of beautiful rigid prose and aesthetic visuals. However all good things come to an end and Indiadaily’s entertainment section is very infrequently updated nowadays, which some conjecture may have been due to the collapse of investment banks like “Bares and Stares” and “Titigrope” . Though nice headlines like “Kareena goes wild on Sardar Saif” and “Priyanka Shahid stare at each other” with balle balle prose like “she went wild and nuts when she saw Sardar Saif. Kareena says she cannot resist her passion for Saif when she him in Sardar dress” can still be found, they are nothing close to the dizzying standards set in previous years. So here are this year’s awards, presented in a new way. Howitzer for Photo-journalism: Goes to this amazing series of photos taken of Amisha Patel at Shilpa Shetty’s wedding. Not only does the photographer, in the best traditions of wild-life photography, catch Amisha Patel at vital moments keeping in mind exactly what the average reader (male) would like to see and not only makes a subtle suggestion of Picasso’s blue period but he also layers in the kind of genius that we at the Howitzer committee so love. Namely lovely captions like “Yeh dhai kilo ka haath” extolling the femininity of her Sunny forearms and “Yeh andar ki baat hain” when the actress’s inner beauty is revealed. Howitzer for Politically Correct Reporting: In a charming piece of politically correct reporting, this awardee article had the following headline “How Deepika Padukone got her Chinki eyes” which was changed, for reasons unknown (perhaps the Chinese government objected to it, like they have objected to India building railroads and dams inside its own territory and also to Badshah snack corner near Shyambajar in Kolkata calling its oily concoction “chow mein”) to “Secret behind Deepika’s Chinese look revealed!” . For proof of the original headline, google “How Deepika Padukone got her Chinki eyes” for mirrors of the original article like the one here and here. Howitzer for Use of Old World English: Goes to this headline which simply says “Priyanka Chopra’s Still Gay”. Howitzer For Patriotic Reporting: While our government, in perhaps a bit of misplaced honesty, tells the world how vulnerable we are to terror in the process making us even more terrified than we already are, trust India TV to assure us that we are as safe and snug as a politician under Z++ category. In yet another example of great investigative reporting [Video], it tells us of a magical machine that the Indian government possesses, whose code name is “Osama ka baap, Dawood ka Dada, Headley ka chacha” , a machine which is so magical that if you just place your hand on it then it can say if you are a terrorist or not. Howitzer for Best Scientific Reporting: This one was the toughest. Would it be “Himalaya main kyon baar baar ate hain Aliens”, India TV’s expose on cross-terrestrial infiltration? [Video] Would it be the exclusive story of four year old child Happy who in his previous birth used to be a man called Sukhvinder and wants to now stay with the parents from his previous birth [Video]? Would it be the elaborately researched story which tells the shocked audience that “Insaan ka satta ka THE END” is imminent with “Robot Raaj” round the corner and where visual proof being provided by actual footage from documentaries like Terminator and I Robot? Would it be the “not even the X Files had this one” story of the udan tastari that was sighted, the one with the most dangerous aliens known to man—-“Nimboo” (Lemon) Aliens led by presumably their leader Lime and Lemony Limca [Video] ? Would it be the startling revelation that many millions of years ago a metor hit near Mumbai and it was this one single meteor responsible for the extermination of the dinosaurs (“Mumbai mein mahavinash aaya tha”) because evidently “Mumbai dinosauron ka adda tha“, a revelation that becomes a soon-to-be-realized prophecy of obsolescence if you replace “dinosauron” with the word “Bihariyon” and the “M-ahavi-N-a-S-hkari meteor” with the letters that stand boldly capital [Video]? 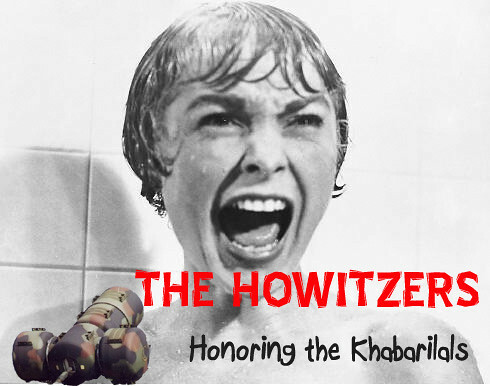 Howitzeron Ka Howitzer: The best of the best. India TV wins it for answering the most important question of them all, the one whose answer the entire nation wants. And what is that? Whoa…always happens to me…missed First by a whisker!! These awards are not diverse. Times of India and India TV sweeped them. I say the author has been paid money to rig the awards. Nishit, I forgot one item I had thought of having. Zoom TV’s coverage of Shilpa Shetty’s wedding. Amisha Patel looks absolutely horrible in these photographs. What happened? The Gay headline had me rolling, though I suspect ToI did it on purpose. On the whole, a great list. I wonder, being the usual type B chauvinist (Bengali chauvinist, for the uninitiated), why not a simillar regional award to Bengali journalism. I assure you that the Calcutta news media will give these poor folks a run for their money. We need a regional award list! A great compilation. India TV ferociously competed with itself. Each ‘piece’ is more deserving than the other. How about something similar on Bollywood and Politics? The popularity of ‘India TV’is a humble reminder of the fact that we as Indians love what they blast as news. Unfortunately, they have the right (wrong?) talent that enables them to be present at the right place. Well in time. How on earth otherwise they know when Ekta Kapoor would make newcomers kiss strangers for audition of a role? The mumbai dinosaurs part is actually true… & the crater formed is named “Shiva crater”. Of course, that news broadcast was the finest specimen of science journalism which can’t be said about the economist article. So do i get an ipod ? Please try and see if you can watch News 9(in english), which we get on the cable at Bangalore. This channel gathered an assortment of people with ESP, who predicted over a week after Micheal Jackson’s death that 1. His atmaa has got a ‘dosh’ as his death was on on Amavasya, 2. He has already taken rebirth,3. His ghost has been sighted and caught on video … get the drift. They also dole out equally interesting issues from other fields of interest like politics, society etc. News 9 truly deserves to be on the list, like ‘best upcoming talent’ at the Filmfare, so that they may reach to the levels of ‘baap, Dada and chacha’ all rolled in one – India TV. Also, why isn’t there a Howitzer for the reviewers who praised ‘Ajaab Gazab’? Wat have they done, not to deserve this award? I speak for them and appeal to you. Disappointing. Like Slumdog Millionaire sweeping the Oscars. India TV should be given the Lifetime Achievement Howitzer and be disqualified from further Howitzers. The Amisha Patel Snaps were pure genius ! i don’t know why you ignored india tv for so long.. but well never too late to win eh? off topic, but would love it if you could write a rejoinder to the crap that has been emanating from Michael Atherton and Simon Wilde (who says the fact that India may become the number one ranked Test team means the rankings are a farce). These guys are so pathetic. actual footage from ‘documentaries’ like Terminator and I Robot.. Hilarious article GB! I really don’t get to watch any news (My in-laws watch only the mallu serials) so this was truly an eye opener..
@heejeebeejee: Hey is there any way u can access News 9 online.. my hubby’s cousin just got a job there as a reporter.. I can’t believe he would be covering crap like this! Btw, does anyone else think there is something seriously wrong with Ameesha Patel’s face? Or were people too busy looking elsewhere 🙂 It looks like either messed up makeup or a bad botox job..
Lisa: read my post on her face. Christ! She looks terrible! Yes her face looked like one from Madam Tussad’s museum. Weird! hi GB. Himalaya mein kyun aate hain bar…. is just too good. thankyou for these rare gems that you collect. I had a great lough reading this post. I dont know if any other soul has watched this piece of journalism but IBN’s hindi news channel once ran a three hour segment on a cloud formation over jammu which looked like a human face. viewers called in to discuss as to whether it was a “divya purush”. a messenger from god. a sign to man that his evil ways were compelling the forces that be to destroy the earth. i dont know if i should bow to the sagely reporter who actually, passionately held forth on this or the callers who called in with longwinded opinions.